There are 8 Assisted Living Facilities in the North Port area, with 2 in North Port and 6 nearby. The average cost of assisted living in North Port is $3,300 per month. This is lower than the national median of $3,346. Cheaper nearby regions include Englewood with an average starting cost of $2,563. To help you with your search, browse the 141 reviews below for assisted living facilities in North Port. On average, consumers rate assisted living in North Port 4.8 out of 5 stars. Better rated regions include Nokomis with an average rating of 4.8 out of 5 stars. Caring.com has helped 5 families in North Port find high-quality senior care. To speak with one of our Family Advisors about assisted living options and costs in North Port, call (855) 863-8283. North Port, in Sarasota County, Florida, is located between Tampa and Fort Meyers and is the perfect destination for those who enjoy nature. The 8,000-acre Myakka State Forest, Warm Mineral Springs and more than 26 parks are within North Port's city limits. Seniors — over 23 percent of the population — can choose between two assisted living facilities in North Port city or from 11 others in nearby Englewood, Port Charlotte and Venice. Florida licenses several types of assisted living communities, with oversight from the Bureau of Health Facility Regulation. Standard homes, like all facilities, provide meals and help with daily activities such as personal hygiene, mobility and bathroom assistance. They're ideal for seniors who want a residential setting and the minor support they need to remain independent. The American Lung Association grades Sarasota County, home of North Port, as an A for particle pollution and B for high-ozone days. Seniors with respiratory conditions should be comfortable with the city's air quality. Florida does not have a state income tax, which means no taxes on retirement income such as pensions, 401(k)s and SSI benefits. There is, however, a 7 percent sales tax on purchases. The cost of living in North Port is just a bit below the national average, but health care costs are 10 percent more expensive. North Port receives 45 percent more rainfall than the average U.S. city, often in the form of thunderstorms. Summers are hot and humid with highs in the low 90s, and winters are short and mild with lows in the 50s. Sarasota County is a member of the AARP Network of Age-Friendly Communities, meaning its elected leadership "has made the commitment to work toward actively making their town, city or county a great place for people of all ages," according to AARP. North Port is a relatively safe city compared to both state and national averages. There are 1.38 violent crimes per 1,000 residents per year, which is less than half the Florida and U.S. averages. Assisted Living costs in North Port start around $3,300 per month on average, while the nationwide average cost of assisted living is $4,000 per month, according to the latest figures from Genworth’s Cost of Care Survey. It’s important to note that assisted living rates in North Port and the surrounding suburbs can vary widely based on factors such as location, the level of care needed, apartment size and the types of amenities offered at each community. 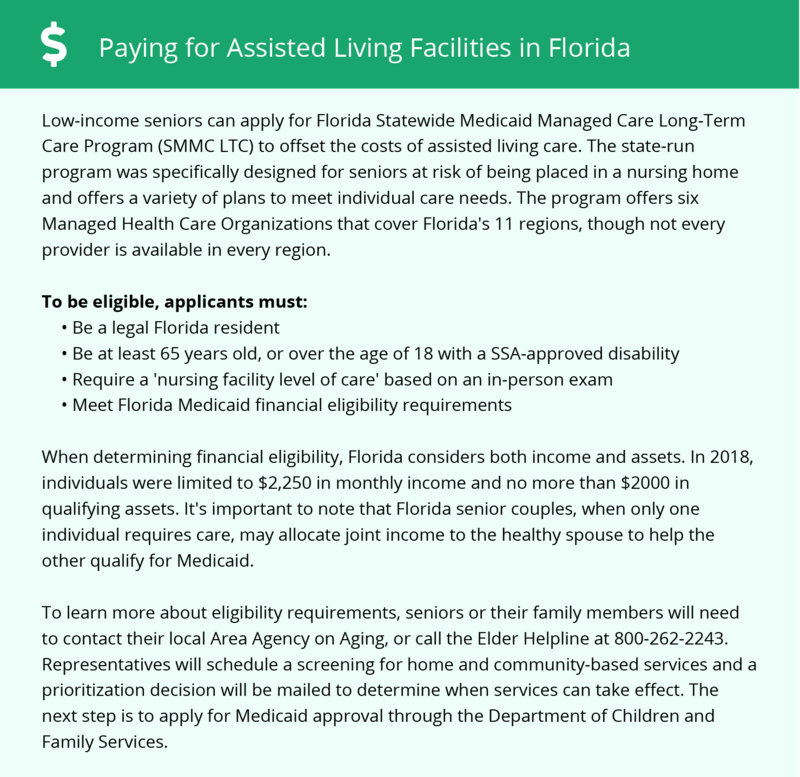 Florida provides optional state supplementation to seniors receiving SSI payments. The state also has two programs, Assistive Care Services and Medicaid Long-Term Care, that help low-income seniors with the cost of services at assisted living facilities. Florida allows families to contribute to room-and-board expenses without jeopardizing Medicaid eligibility. To see a list of free assisted living resources in North Port, please visit our Assisted Living in Florida page. North Port-area assisted living communities must adhere to the comprehensive set of state laws and regulations that all assisted living communities in Florida are required to follow. Visit our Assisted Living in Florida page for more information about these laws.